Paint the Town Red: Biking the environ of San Marco. My neck of the woods, San Marco, located just south of Downtown and connected most directly by the Main Street, Fuller Warren, and Acosta Bridges, brings you all the comforts of your northern home with bungalow style houses from the Arts and Crafts era, Victorian homes, and other tastefully rendered, old but sturdy structures. From the north end of the short-but-sweet strip of San Marco Boulevard, cycle your way to the southeast end. At the north end, get some down home BBQ at The Q. Or for something more fancy, Bistro Aix attracts folks from all over Jacksonville and cities beyond. Across the street, get your workout groove on with Dance Trance. For a cornucopia of gourmet sandwich selections, check out European Street. Meander in and out of the surrounding neighborhoods, making sure to pass by the river’s banks from time to time. At the southeast end of the boulevard’s curve is San Marco Square where you’ll find quintessential square-like shops and eateries like Pizza Palace, Starbucks, San Marco Deli, First Place Sports, various clothing boutiques, and a sprinkling of art galleries, bar lounges*, and clubs*. 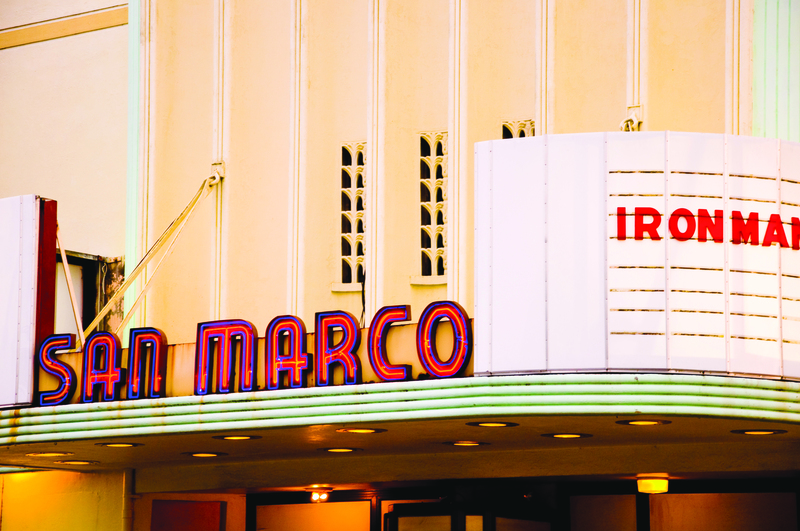 San Marco Theatre is a historic little venue of the silver screen which also serves decent food such as pizza, sandwiches, and quesadillas. The Square also hosts various mini music, art, and year-round holiday festivals. Venture onto North Hendricks and, though you’ll have a really hard time finding it, check out Jack Rabbits* which is one of the non-mainstream music nation’s best kept secrets, hosting underground and indie bands from all over the country. Further north on Hendricks are more little boutiques and great places to eat and at the very end is Reddi Arts, where you’ll find many of your art supply needs. Even further north, grab a hotdog and check your Facebook notifications at Hard Wired. On Prudential you can check out a free outdoor movie during Movies in the Park at Treaty Oak during certain times of the year. And for a romantic date with that someone special, try some delicious dishes together at The Charthouse. Venture east on Atlantic for a bit and hit San Marco’s nearby neighbor, the environ of St. Nicholas. Venture south on Hendricks for more great neighborhoods to explore and make a pit stop at Metro Diner, a decadently delicious little spot where locals gather by the truck loads for breakfast food stuffs you wont soon forget. If you’re looking for a fairly long, non-stop ride that’s easy on the eyes, try starting at the north most end of San Marco Blvd and veer right onto Hendricks (which turns into San Jose) going south until you reach Baymeadows Road. There you’ll get a shady, scenic, and ever-so-slightly hilly ride for about 22 miles going up and back. Along the way, you’ll surely pass other roadies sporting their spandex proudly as they fly like the wind. I’d like to encourage all you steel-framed fixed gear riders to bike this strip of road more often. Be sure to wave in fellowship as you pedal push it past all those guys and gals riding their multi-thousand dollar carbon fiber 12-speeds. Nothing wrong with a little friendly competition amongst other fellow cyclists, after all. Like any big city, there’s always going to be a variety of fun new experiences waiting for you to take advantage of them. You just have to look for them, be involved in your community, and get to know the locals. Rest assured, you’ll find plenty of people here who are very proud of their city and eager to let you in on its secrets, some of which include the riders of the JBC. *Please note, neither I, nor The University of North Florida, in any way supports or promotes underage drinking. For those old enough, drink responsibly and never drink and drive.